One of the main concerns that most people will have when they find out that wild animals are either nesting within their home or are gaining access to the property is about the diseases that these animals can carry. While the instances of diseases being transmitted from wild animals to people are quite rare, they can also be quite dangerous, so it is important to take precautions to avoid the transmission of these types of diseases. Depending on the species, there are a variety of different ways that they can transmit disease, including through urine and feces as well as biting the victim, while the treatment and responses required can vary too. There are some animal species such as rats and bats that are assumed to be carrying diseases, and others which people tend to view as sweet or cute animals, but the reality is that almost every animal that come into contact with people can transmit diseases. It is certainly true that rats are a particular problem, and not only transmit diseases through their feces and urine, but can also transmit disease through scratching and biting. From feral cats through to skunks, raccoons and other animals, even exotic pets that have been released such as parrots and parakeets can transmit disease, so the best advice is to be cautious and to take the necessary precautions when you deal with wild animals. This is one of the most important and the most dangerous diseases that can be transmitted by wild animals, and while many people will associate the disease mainly with dogs, it is actually a condition that can be transmitted by most animals. 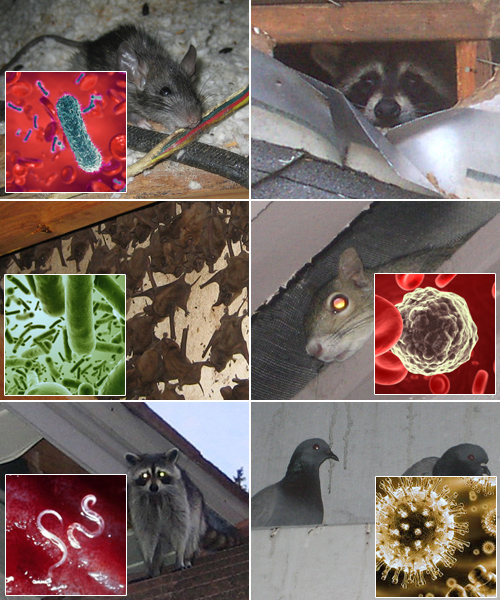 In the majority of cases in the United States, rabies is transmitted by raccoons, bats and foxes. The symptoms of the disease in both humans and animals can include a severe aversion to water, flu like symptoms and confusion or delirium. If the treatment for the disease is not administered very quickly after an animal bite, less than one in ten people will survive. One of the biggest factors to consider when it comes to the diseases that can be transmitted by wild animals is their urine and feces, and dangerous conditions such as Leptospirosis and Histoplasmosis can be transmitted in this way. These diseases can have a significant impact on the the human respiratory system, and are usually transmitted when the feces of an animal is disturbed and the spores of the disease become airborne, which is why so many professionals wear a mask when they clean up such material. Rat bite fever is another condition that can happen when come into contact with rats and other rodents, and can be debilitating for the individual. It is also worth being aware of the diseases that can be transmitted by ticks, including Tick-borne relapsing fever and Lyme disease. Pets are often considered to be a part of the family when it comes to many households, but the presence of wild animals can lead to diseases being transmitted to pets as well as diseases that can be directly transmitted to humans. As pets will often be more likely to investigate scents left by other animals and even the feces of other animals, this is where they can be contracted, while a bite or scratch from a diseased animal can also be the cause of disease. There are a huge number of different diseases that pets can contract from wild animals, with canine distemper being one of the most damaging, which can be fatal if it isn't treated quickly. Other conditions such as leptospirosis and ringworm can be easily transmitted, while toxoplasmosis can be transmitted through the ingestion of the feces of other animals. When it comes to trying to avoid the transmission of diseases to yourself, your family and your pets, there are several steps that you can take to try and avoid this kind of disease. The first step is to try and keep any contact with wild animals to a minimum, with steps such as maintaining the fences in your garden and reducing the features that attract wild animals to your property being a useful step towards this goal. If you do identify that wild animals are either visiting your property or are nesting in the roof, wall cavity or another area of the property, it is then best to trap and remove the animal, or to hire a professional to help you to carry out this work. When it comes to cleaning up the feces of animals once they have been removed, make sure you wear a breathing mask, as spores from this feces can still transmit diseases which can be particularly debilitating. Go back to the main How to Get Rid of Wild Animals page for more information about animal trapping and information about Wildlife Diseases That Can Be Transmitted By Wild Animals to People or Pets.